Did we not just have the most beautiful weekend? It felt exactly as summer should, and as quickly as this first week of June has just passed by, I know I'm in trouble. I want summer to go as slowly as possible, but with so many busy weekends ahead of me, I fear I will once again fail at savoring summer. What do you want most this summer? Have you entered the Simple Skincare giveaway yet? HELLO BEAUTIFUL PERFECTION! OMG. Seriously, this outfit could not be more perfect. The texture, the skirt, everything! Summer truly feels slipping away already even not started properly. 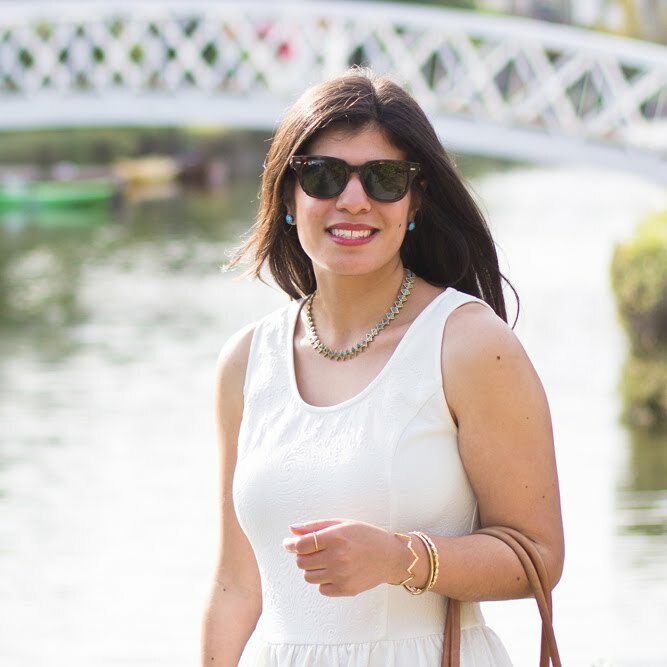 Hope we'll have many beautiful summer days and evenings to spend in style, like you did with this gorgeous look. Oh, that Tee is just so adorable and seem to work with anything what you pair with. Great piece to have in wardrobe. The weather this weekend was indeed gorgeous. I'm all for summer going by slowly too! Love the t-shirt and purse. Cute look! Loving the pattern on that skirt, hope you had a lovely weekend!! Such a cute mix here! Love your patterned skirt + graphic t-shirt! 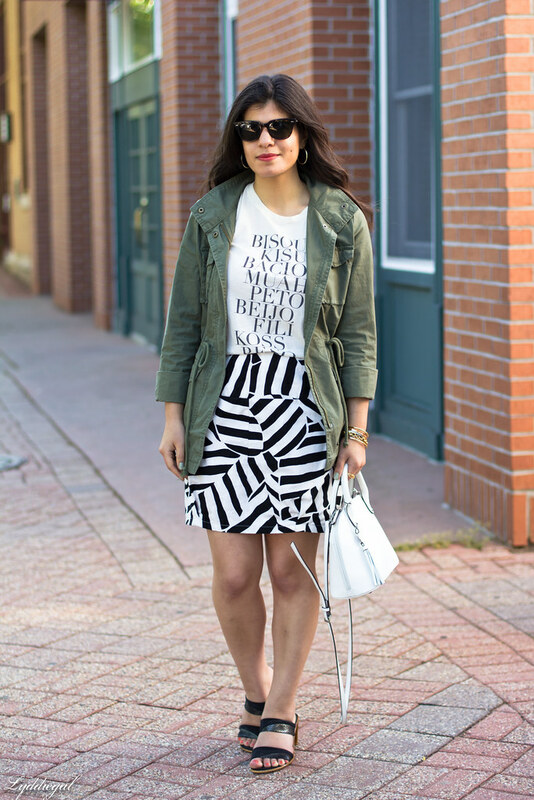 Love the way you mixed the graphic tee with a graphic skirt! Loving the graphic tee Lydia, super cute look. Love this look!! That tee is perfect!! I always want to savor summer as well, but being in an office all day hinders that! So I definitely live for the weekend!! The skirt! Oh my gosh, the skirt! Love, love, love that print! This is such an amazing, versatile tee! I have loved seeing all the different ways you have styled it! I'm pretty sure you summed up my summer dreams perfectly! I am headed to the pool for the first time this coming weekend and I am SO EXCITED. Gah, slow down summer! Perfect look dear, this skirt and this shirt is really nice, love everything. That all sounds perfectly delightful! I love your outfit. That shirt is so fun and perfect with your skirt! 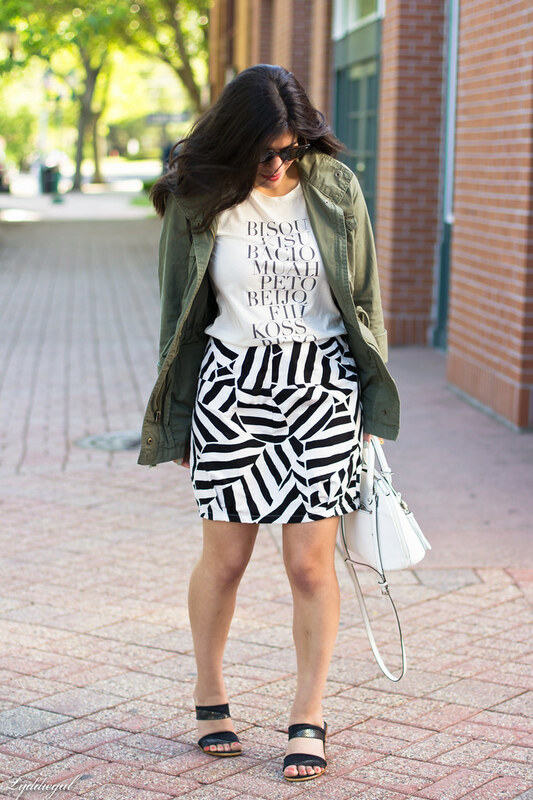 This weekend's weather was absolute perfection :) I love the fun mix of this tee and skirt! Well unfortunately our whole weekend was chilly and rainy. But the rest of the week promises to be sunny and warm! I love this tee so much. 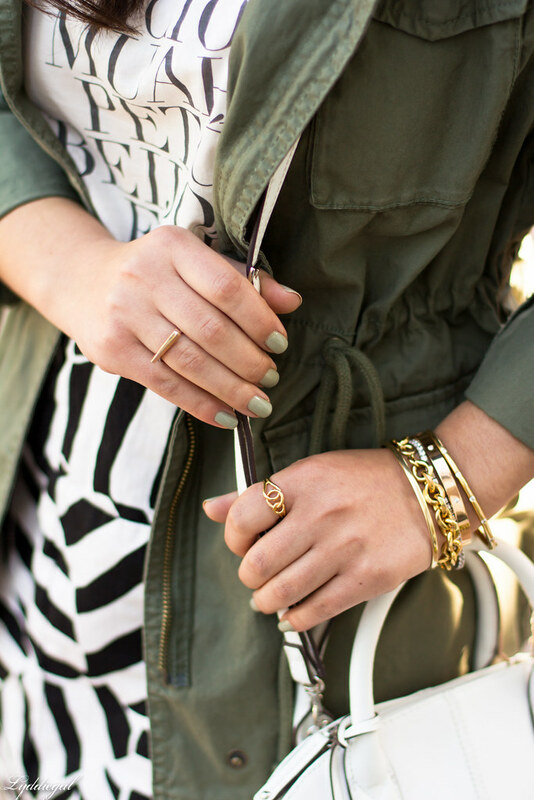 Looks great with the military jacket and graphic skirt! Nice skirt. I like the way the stripes are all over the place. A beach trip! I feel that if I don't go to the beach at least once each summer, it's a fail. Also, I've been wanting to do this for ages and maybe this summer I finally will- see a movie in Bryant Park! I love that J.Crew T-Shirt. I like your mix of dressy and casual. Your skirt's pattern is so cool, love it! 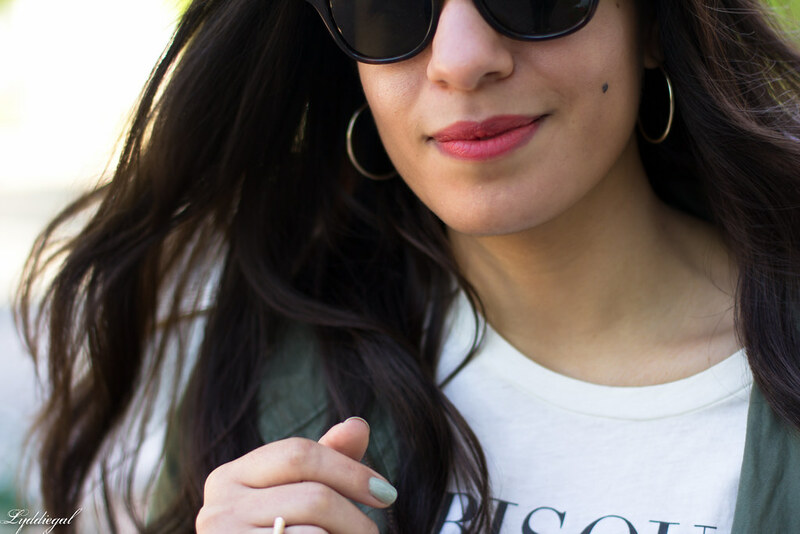 Ok your description of summer savoring sounds like perfection--now if the world could just slow down so we can all make it happen :) But you are looking fabulous--love the graphic tee! 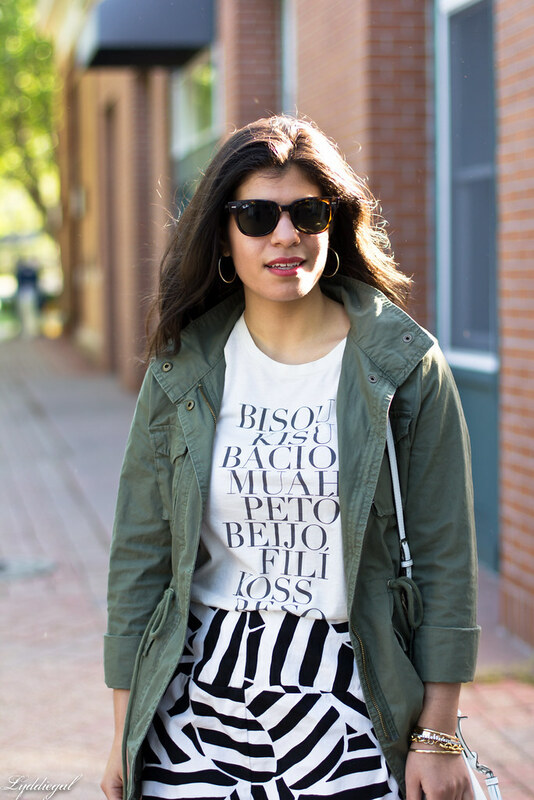 i'm so obsessed with graphic tees at the moment and i love how you created this black/white outfit with an army jacket! I know exactly what you mean. I'm trying to enjoy each and everyday. Live each day to the fullest Lydia. Love your tee! Such a gorgeous look all around! 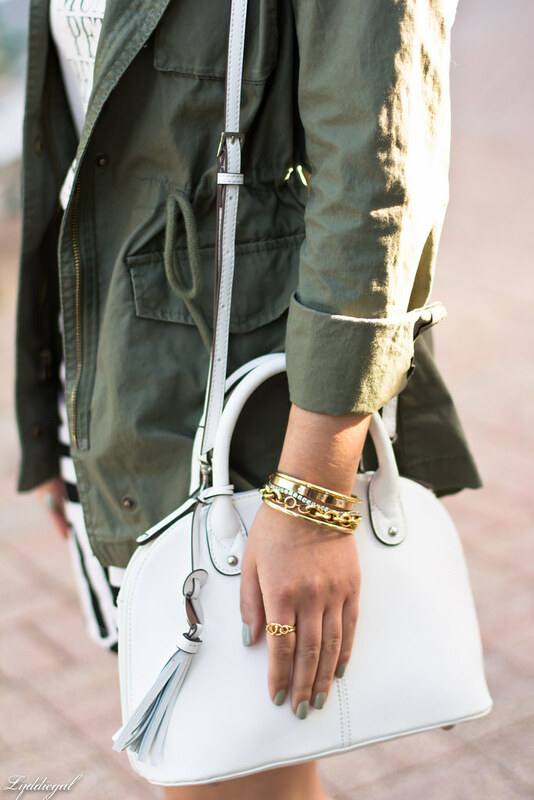 Love the military jacket paired with the black and white and that skirt is amazing. This outfit is gorgeous, love everything about it. I love your skirt. Hope you had a lovely weekend! I love sitting outside in the evenings enjoying the summer breeze (with no mosquitos, of course!). That t-shirt is so versatile and love it with the graphic skirt. I REALLY love this look! That skirt is so perfect with that jacket! Gorgeous! So so true! I feel like the summer months of bliss are going to fly like this weekend! This outfit is just too fun! I want the same except for the early morning walks I love to sleep in. You look pretty, love that skirt. If you get the chance, please share your amazing post on my link-up today. Love the monochrome skirt! Very chic! Woop, I'm rambling! Anywho, I love that olive jacket yet again. And that skirt is so fun--very postmodern! I love this outfit! I wear a very similar one with the same skirt, tee, jacket combo. I hope you get to enjoy summer! It's a little longer down here in the south. We usually get summer through mid September! What an adorable skirt!! I love the print! How fun. This is such a cute look! I want to go to the beach the most this summer, but it sadly isn't going to happen. So chic! I love how you pair the printed skirt with the utility jacket. I'm totally in love with the print if that skirt. The weather was perfect this weekend! Love this laid-back look! Love your skirt! The weekend's weather was fantastic. This is my favorite time of year too, so I'm in no rush to see it go by. Such a chic look, that statement T-shirt is so cute!!! Plus, that skirt has the perfect cut and print, you're so lucky! !